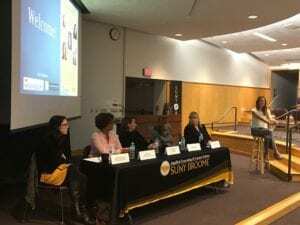 SUNY Broome’s inaugural Career Week was a huge success! Students enjoyed the Build A Bear workshop during Career Week. The Applied Learning & Career Center recently hosted SUNY Broome’s very first Career Week (Oct. 29 through Nov. 2) to celebrate National Career Development Month (November). The ALCC collaborated with the STEM Division, Counseling Services department, Student Activities and the Women’s Institute to put on a series of events each day of the week. The larger scale events included the STEM Employer Showcase, which brought representatives from 13 local companies to the Calice Advanced Manufacturing Center atrium, giving students an opportunity to learn more about careers in various STEM career fields. On Tuesday, five esteemed women professionals, some of whom were in industries not traditionally occupied by females, shared their personal stories, career journeys and tips during the Women & Work Career Panel and Networking event. Thursday’s annual Transfer Day brought 60+ college institutions to campus to answer questions for students considering continuing their education beyond SUNY Broome. Other events included Workshop Wednesday, which offered a variety of workshops including: LinkedIn Lab, Career Exploration Workshop, Resume Roadshow, and Purple Briefcase and Big Interview demos. In addition, Fashion Friday offered a fun and interactive way to educate students on appropriate interview attire and promoted ALCC’s upcoming Career Closet initiative, which will provide professional clothing to students at no cost. Throughout the week, more than 500 students participated in some form or another with these events. The ALCC wishes to thank the campus partners and community representatives, as well as the students, for making our inaugural Career Week such a success!